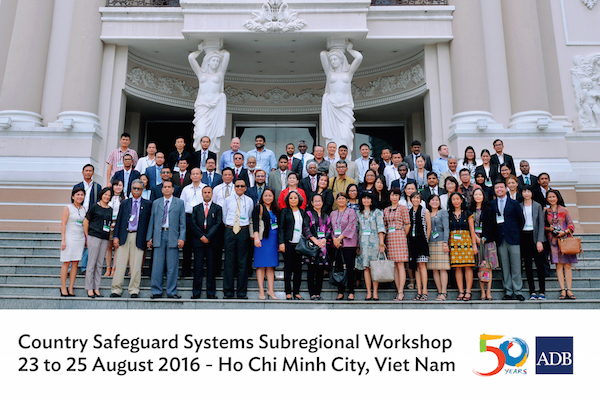 Eighty participants from 13 DMCs in South and Southeast Asia attended the Country Safeguard Systems Subregional Workshop in Ho Chi Minh City, Viet Nam on 23-25 August 2016. The workshop was organized by Asian Development Bank's Sustainable Development and Climate Change Department with support from South Asia Department and Southeast Asia Department under TA 7566 for Strengthening and Use of Country Safeguard Systems (CSS). It featured CSS developments and highlighted progress of work on Powergrid Indiaís agency-level and Indonesiaís national and sectoral-level CSS application.